New Delhi, March 21: The Bharatiya Janata Party (BJP) on Thursday released its first list of candidates for the upcoming Lok Sabha elections 2019. The party has named 182 candidates, including Prime Minister Narendra Modi from Varanasi and BJP president Amit Shah from Gandhinagar. Meanwhile, Union Ministers Rajnath Singh and Nitin Gadkari have been fielded again from Lucknow and Nagpur, respectively. Prominent candidates re-fielded by the party includes Ram Kripal Yadav from Pataliputra, Sanjeev Balyan from Muzaffarnagar, Anant Kumar Hegde from Uttara Kannada, Mahesh Sharma from Noida, VK Singh from Ghaziabad, Prahlad Joshi from Dharwad, Satyapal Singh from Baghpat and Hansraj Ahir from Chandrapur. Check Full Schedule of Lok Sabha Polls 2019. Other candidates include Shobha Karandlaje from Udupi-Chikmagalur, Manoj Sinha from Ghazipur, Radha Mohan Singh from Purvi Champaran and Babul Supriyo from Asansol. From Bhiwandi, the party has given the ticket to Kapil Patil, Rajdeep Roy from Silchar, Gopal Shetty from Mumbai North, Pradan Baruah from Lakhimpur and Kiren Rijiju from Arunachal West. From Srinagar, the party has fielded Khalid Jahangir, whereas, the candidate from Anantnag is Sophi Yousuf, announced JP Nadda. Jugal Kishore to contest from Jammu and Jitendra Singh from Udhampur, he added. In Mumbai North, the BJP has reposed faith in the incumbent MP Poonam Mahajan; from Ernakulam - Union Minister K Alphons has been nominated. In Thiruvananthapuram, K Rajasekharan will be taking against Congress' Shashi Tharoor. From Ajmer, the party has fielded Bhagirath Choudhary, whereas, the candidate in Kota is Om Birla. Union Minister Arjun Ram Meghwal will contest from Bikaner. Union Minister Pon Radhakrishnan has been issued the ticket from Kanyakumari, Sadananda Gowda from Bengaluru North, Pratima Bhome from Tripura East and Debashree Chowdhury from Raiganj. 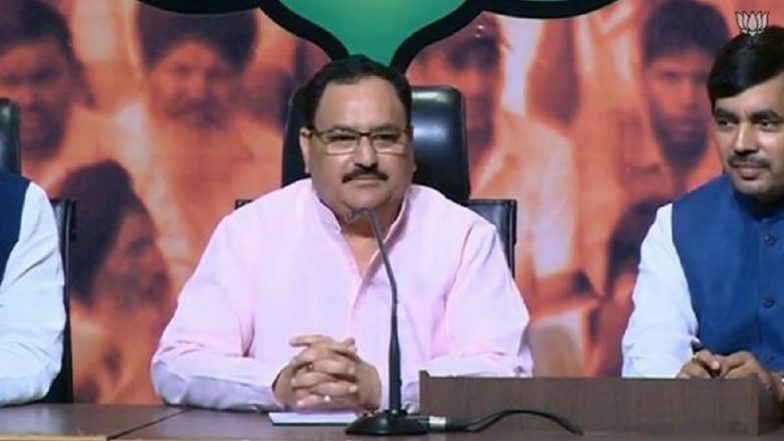 "We have named 184 candidates which were finalised in the CEC meeting attended by our Prime Minister, BJP president, (Home Minister) Rajnath Singh ji and (External Affairs Minister) Sushma Swaraj," Nadda said. The list, however, does not include BJP veteran Lal Krishna Advani, who is currently the lawmaker from Gandhinagar. The BJP list comes a day after the Congress released its sixth list for the general elections. Unlike the ruling regime, the prime Opposition party is finalising and revealing fewer number of candidates per list. So far, they have revealed their aspirants from a total of 146 constituencies. One of the prime challenges before the Congress is to finalise the seat-sharing agreement in Bihar. While the BJP has succeeded in inking a clear pre-poll pact with the JD(U) and the LJP in the state, the Rahul Gandhi-led outfit is embroiled in hectic parleys with the six party-Mahagathbandhan.